Some born-and-bred NYC residents will tell you that you’re not a true New Yorker until you have a subscription to The New Yorker. As much as we all want to be thought of as part of the city’s intellectual elite, it can often be challenging to read the hefty magazine from cover to cover (though you can now watch the publication on Amazon), but one thing we never skip are the witty cartoons, especially those from legendary staff cartoonist Roz Chast. Known for her “colorful, wry, and slightly deranged” cartoons, Chast’s work has graced the pages of The New Yorker for 36 years, leading to the publication of more than 1,270 cartoons in the magazine and over a dozen books. 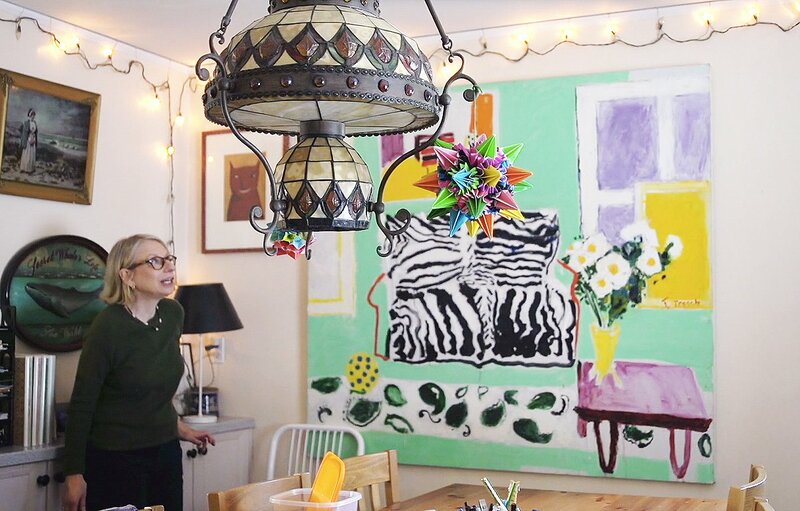 A new video from the magazine takes readers inside her Ridgefield, Connecticut home and studio, where she’s lived with husband and humor writer Bill Franzen since 1990. Chast describes her residence as “a kind of notebook” where she creates her weekly batch of cartoons. Roz Chast’s home perfectly matches her quirky cartoons, from her two pet parrots, one of whom shares the same nervous qualities as most of her drawn characters, to her visual display of canned foods, which inspired a 1991 New Yorker cover. The personality of her cartoons also comes through in her crafting projects, including origami, elaborately painted Ukrainian pysanky eggs and a rug depicting portraits of her late parents.